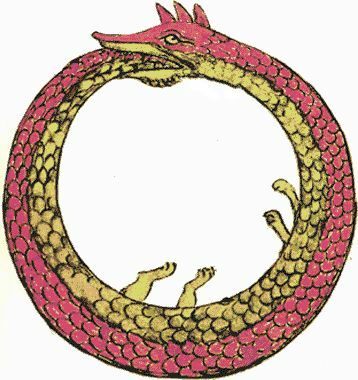 The motif of the ouroboros appears in the ancient cultures of Egypt, India, Greece and Mexico, and was of particular interest to European alchemists in the early modern era. 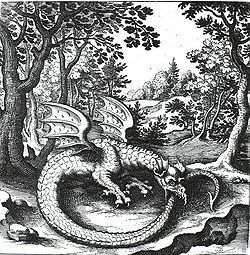 Conventionally it depicts a serpent or a dragon eating its own tail, from the Greek oura/voros = tail-eater. To the alchemists the symbol came to signify cyclicity, and thus, in a human context, self-reflexivity. In my beginning is my end. The idea of eternal return and intrinsic self-renewal. I am not quite a mystic, but many of my favourite poets were. catalogue to an exhibition on labyrinths that I attended in Barcelona last year, there is a short essay by Umberto Eco, in which, after discussing the difference between the uni-cursal labyrinth (in which there is only one route in and out, as in the illustration above) and the multi-cursal labyrinth or maze or Irrweg (in which there are alternative paths, all leading to dead ends: you can make mistakes, and may have to retrace your steps, but you will always be able to get out) he proposes a third type of labyrinth, the network, in which each point can be connected to any other point, which makes it possible to travel around for ever. And you never get out of the network: you keep going round and round inside. 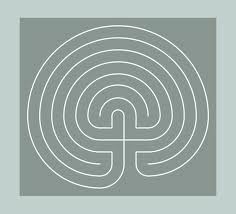 So, both the ouroboros and the labyrinth have served as representations of energy, of flow, and of the questing human soul, or at the very least as symbols of regeneration. They are linked in profound and deeply sympathetic ways. And then, as if to confirm the last happy thought, I come across this fabulous video, titled Ouroboros. It seems a good place to leave these thoughts hanging.